You will be purchasing the downloads from my authorized reseller Comecero, LLC. 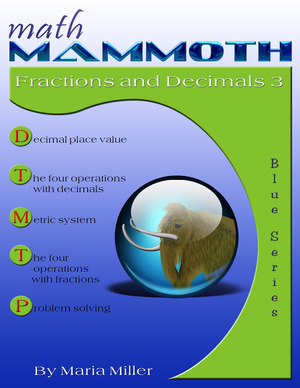 Math Mammoth Fractions & Decimals 3 continues the study of fraction and decimal topics on the 6th grade level. This book assumes the student already has studied fractions and decimals in the past, for example using Math Mammoth Fractions 2 and Math Mammoth Decimals 2. The PDF version of this book is enabled for annotation. This means that if you prefer, the student can fill it in on the computer, using the typewriter and drawing tools in Adobe Reader version 9 or greater. The goal of the book is to go through all of the fraction and decimal arithmetic, using up to six decimal digits and larger denominators in fractions than what is commonly encountered in 4th and 5th grade materials. For some students, this may mean a lot of review, but some students need to restudy these topics if they did not quite master them in earlier grades. The book starts out with the study of decimals, the metric system, and using decimals in measuring units. If the student already has a good grasp of decimals, consider assigning only 1/3 - 1/2 of the problems, and he should be able to go through those lessons quickly. We start out by studying place value with decimals and comparing decimals, up to six decimal digits. The next several lessons contain mainly review, just using longer decimals than in 5th grade: adding and subtracting decimals, rounding decimals, using mental math for multiplying and dividing decimals, long division with decimals, fractions to decimals, and multiplying and dividing decimals by the powers of ten. Scientific notation is a new topic. After that, we turn our attention one more time to dividing decimals by decimals. I have tried to explain the principle behind the common shortcut ("Move the decimal point in both the divisor and the dividend enough steps that the divisor becomes a whole number"). This shortcut actually has to do with the principle that when you multiply the divisor and the dividend by the same number (any number), the value of the quotient does not change. This even ties in with equivalent fractions. Many textbooks never explain this principle in connection with decimal division. The last lessons in the section with decimals deal with measuring units and the metric system, and nicely round up our study of decimals. After decimals, the book covers all fraction arithmetic. The goal is that the student will become "fluent" with basic fraction operations, if he isn't already. I assume the student has already studied the four operations of fractions (in 5th grade), so the coverage of this book is slightly quicker and not so in-depth as in Math Mammoth Fractions 1 and Math Mammoth Fractions 2 books. For example, the lessons don't always delve into the reasons why a certain shortcut works—a lot of that is explained in those two books mentioned. While I consider it very important that the student understands fractions conceptually and understands why certain things are done the way they are done, the material here is building on the material for the earlier grades, where the students have been exposed to those thoughts and ideas. The lesson Comparing Fraction and Decimal Division is optional. Often, you can solve the same division problem using either fraction or decimal division, if you can convert the numbers from decimals to fractions or vice versa. This lesson just examines the difference between fraction division and decimal division, and best suits advanced students who are interested in it. The page about fraction equations is also optional and can be omitted. Besides re-studying fraction operations, students also have several problem-solving lessons to study. A lot of the problems in these lessons review and reinforce already studied concepts, such as ratio and using bar diagrams to solve problems with fractional parts. As a new—and hopefully interesting—application, we study scaling in maps. Math Mammoth Fractions 1—a worktext about fraction addition & subtraction, mixed numbers, equivalent fractions, and more (grades 5-6). Math Mammoth Fractions 2—a worktext about fraction multiplication and division and related topics (grades 5-6). Math Mammoth Decimals 1—a solid introduction to decimal numbers with emphasis on mental math (grades 4-5). 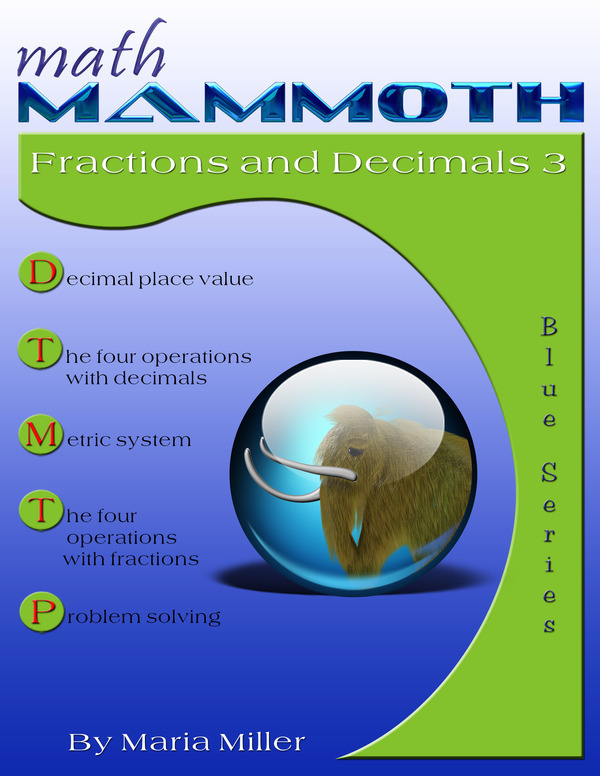 Math Mammoth Decimals 2—a worktext about decimal place value and all basic operations with decimals (grades 5-6). Make It Real Learning: Fractions, Percents, and Decimals I—an activity workbook with real-world data, focusing on situations that use fractions, percents, and unit conversion (grades 4-7). Make It Real Learning: Fractions, Percents, and Decimals II—an activity workbook with real-world data, focusing on situations that use decimals, ratios, histograms, and percents (grades 5-9).